I was walking underneath the overhang sheltering the gas pumps at my local Kwik Trip when I noticed a giant spider dangling eye level about two feet from my face. I quickly proceeded to back away from it when I felt that familiar sticky tug on my arm alerting me to the fact I had snagged a bit of the spider’s web. As I proceeded to back away from the dangling menace of my nightmares, in a jerky & swatting manner that only be described as Kramer-esque, I noticed the ensnared web ensured the spider would follow me at an equal distance with each step. As I envisioned one wrong move causing the spider to catapult onto me, my ninja-like defensive moves only intensified. Any well-read onlookers surely must have thought they were watching a real live Don Quixote battling his windmill, as I’m sure the spider was invisible from a distance, but in the end my evasive maneuvering won the day. I broke free from the web and watched the pursuing spider swing back into the distance. He will rebuild his web for the next unsuspecting driver. I proudly marched away without the slightest concern regarding how ridiculous I must have looked to the other people pumping gas. That, my friends, is exactly why I could never live down south. My version of a scary spider in Wisconsin, and a southerner’s version of a scary spider are going to be completely different. Their spiders make ours look like kittens. So instead, I will bring the best parts of south to me. And that means I am growing okra in my garden! Yes, Wisconsin climate is not ideal for okra growing but I do get a big enough yield to give me a few jars of spicy dill pickled okra each year! You will want to ensure you only select small okra pods for pickling. Larger pods over 5” long will get fibrous and be impossible to chew, which I learned the hard way. The younger, smaller, pods are ideal for pickling. 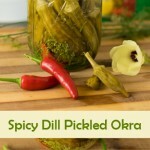 This spicy dill pickled okra recipe works well for canning or for storage in the fridge. If you are canning, you will want to purchase a quality canning kit to get started. There is no better brand in the business than Ball, it will be money well spent. 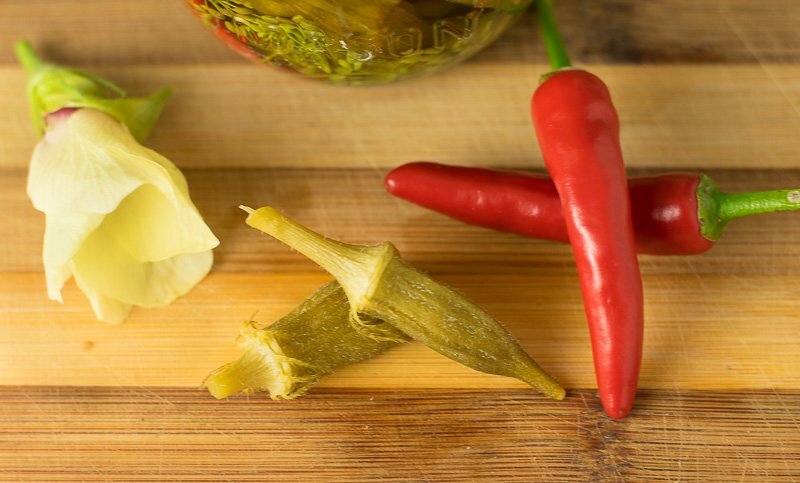 This spicy dill pickled okra recipe is ideal for canning, yet well suited for storing in the fridge instead. Pierce each okra pod once with fork or knife to allow brine inside. Add water, vinegar and salt to sauce pan and bring to boil and cook until salt has disolved. 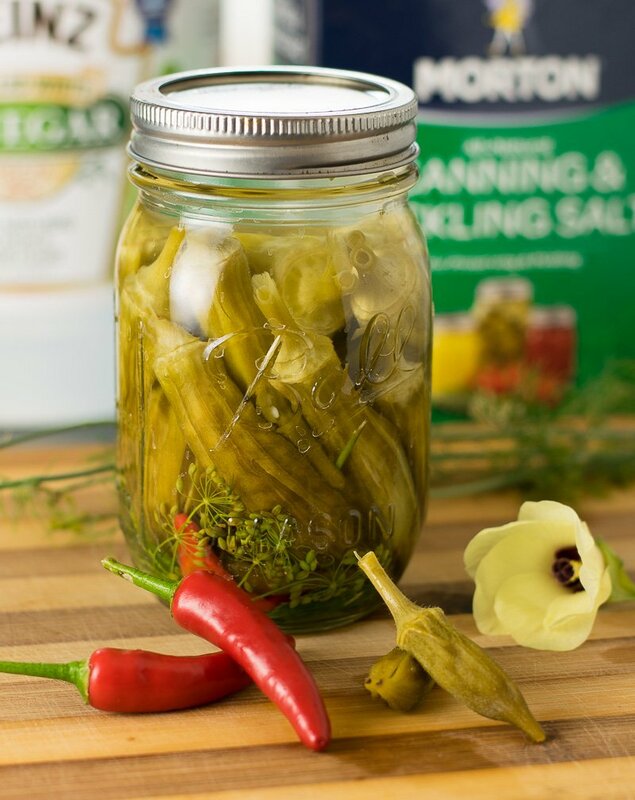 Place okra and remaining vegetables in clean jars and add brine. Process for 10 minutes in waterbath if canning, otherwise place directly in fridge. Let sit overnight prior to eating. Your yield will vary depending on how tight you pack each jar. If you enjoyed reading my spicy dill pickled okra recipe then you should probably like me on Facebook and follow me on Pinterest too. That’s what I would do at least, because if you don’t get to know me but you still use my recipe it is kind of like taking candy from a stranger, and your mom taught you not to do that. Don’t disobey your mom, subscribe to Fox Valley Foodie today. Did you mean “1 clove” of garlic per jar vs. “1 head” of garlic per jar? Yes, thanks for catching that!